Welcome to a new week and new recipe. It has been a while since I’ve written a post and I’ve been slow lately when it comes to developing new recipes. Sorry for the delay but first I’d like to let you in on the latest developments her over on my side. It probably doesn’t come as a surprise that I enjoy baking and I have had my share of flops but as the saying goes “Practice makes perfect” or at let’s just say close to perfect. That word can sound scary and I am not into creating anything perfect, just pleasing to the eyes, senses and above all taste buds. So to make a long story short. I have been exploring the idea of selling my cakes to local bakeries and cafes and all with the best ingredients I can get a hold of. Mostly I would like to offer a range of cakes that are vegan, gluten-free and refined sugar free. I have had this idea for a long time but the realization has taken a long time and I honestly didn’t feel confident enough to share my cakes with a wider audience until I recently took part in a Pop-up market before Christmas. Most of the reactions were really positive so that I thought, why not give it a go. I am far away from having established myself but I do sense this urge to share my cakes with a wider audience and by writing it down here I get an additional boost of energy to follow through. I suffer from an extreme form of procrastination. If I think too long about something I eventually give up because the list of things that could go wrong are so overwhelming. The beauty about delving in any affair of my own is that if it doesn’t work out I can walk away with grace and it remains my own decision. I also thought about opening my own cafe but I don’t feel ready at the moment. Being a Mom of three still not fully independent children is a huge responsibility and I think having a cafe or restaurant is like having an additional baby or spouse that you are committed to 24/7. I guess when one of my babies is out of the house (sounds harsh, doesn’t it ?) I’ll be able to think about letting in another baby into my life. I honestly believe that most things happen to me at the right time and I think it is something I would really love to do. Having a place that is like an extension of my own living space is something that I have dreamt about a long time and another big dream is to cook at a retreat like setting in a beautiful location on the sea. Since I’m familiar with Croatia, I think it could be wonderful there and I know that there is demand for such retreats. I will let you know about the upcoming events and of course if you are at home in Vienna or are in the Vienna area around the 4th of May you can visit me at a wonderful event taking place in the Volkskunde Museum. It is a Pop Up Market for female designers and young business owners who still don’t have their own shops. The organizers are two wonderful women who have been working day and night to create an event that provides so many wonderful women a one of kind opportunity to present their crafts to a large audience. I am so excited to be a part of it. On another similar note, I have come together with the wonderful Kira Frerk to organize my first Yoga Brunch and it will take place in her own yoga studio in the beautiful 19th district of Vienna. The morning will begin with 2 hours of energizing and revitalizing Yin Yoga followed by a brunch mad by yours truly featuring some of my favorite breakfast fare like scrambled tofu, granola and pancakes. For more information please contact me or leave a comment below.I’ll also post it on my events page. Finally, let us get to this recipe. 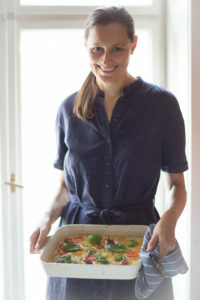 Firstly, I have attempted to keep things simple which is not always easy for me but it is such a pleasure when I succeed in making something delicious that doesn’t take more than 30 minutes. So it is with this simple pasta dish. It unites three or let’s say four components which are all delicious but together become something special. Mondays have always been pasta days in my home and there is something comforting about knowing each week what I will be eating. It has become such a tradition that if it doesn’t happen it somehow doesn’t feel right. I am by no means a traditionalist but here it feels almost like a sacrilege not to eat pasta on Monday. Mondays are also the days when I prepare some of the staples that I will use the rest of the week. like Tahin or my favorite chili sauce, Harissa. I have a Thermomix which makes my life so much easier. If you have a powerful blender like a Vitamix you can also make your own nut butter but if you don’t care to you can of course use store bought Tahin. 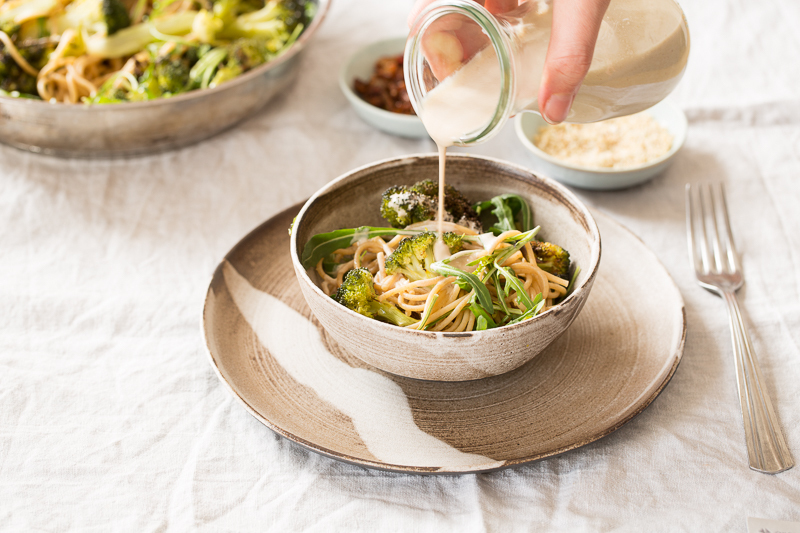 Tahin is basis for this simple sauce and once I’ve made the Tahin I scoop out most of it into a clear jar and what remains in the Thermomix I simply turn into a sauce, so I use every last drop. No waste and a delicious sauce to boot. I simply add one garlic clove, a little olive oil, lemon juice, cumin and water and that’s it! The second sauce is harissa, a Tunisian chili paste that can also be bought in some specialty stores but homemade is better and so easy to make. Once again, if you are not the DIY type just go for the closest thing you can find. 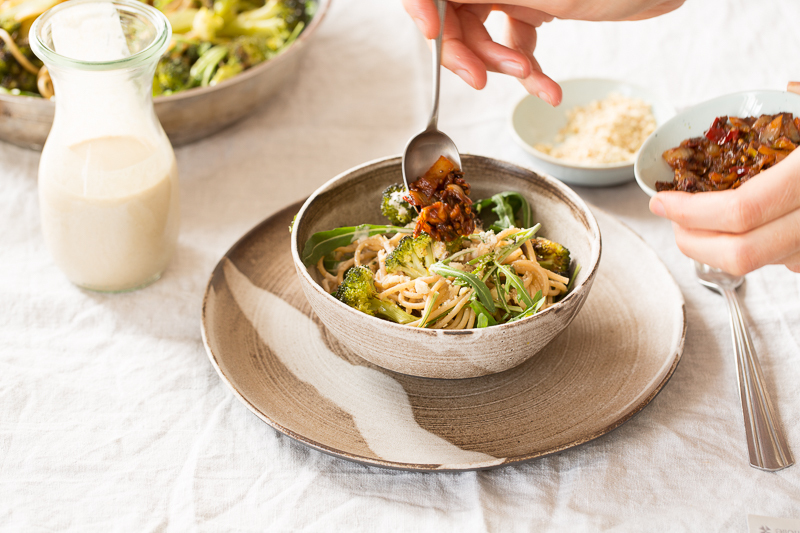 I’m sure any chili sauce would be fine because roasted broccoli and chili are a match made in heaven! Try it out. 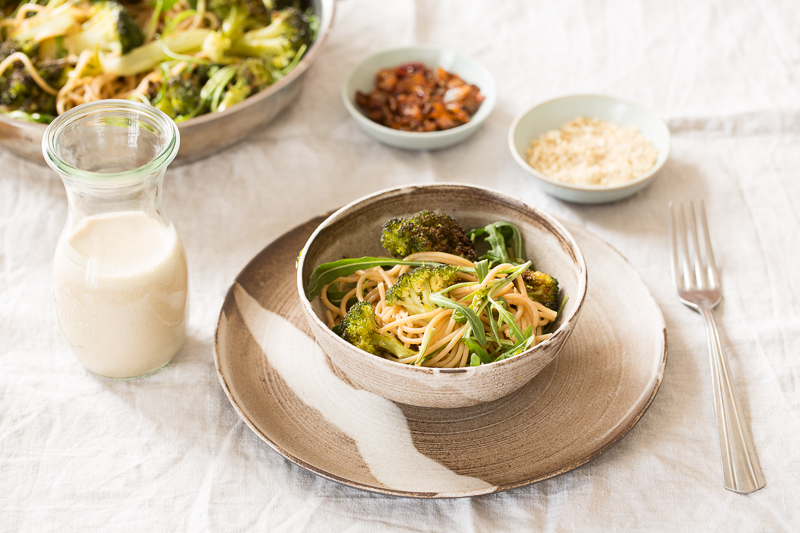 While all these things are coming together you can boil your pasta water and roast the broccoli. I added some fresh arugula to make it fresh and any citrus juice would work as well. Lemon or lime. I also had some extra hemp parmesan from the other day and I sprinkled that on top. That is also entirely optional but I highly recommend it for those of you who miss eating parmesan.So, there you have it. Simple Monday pasta. Let me know if you make it and how it goes, I would be delighted to hear from you. Also tag me on Instagram #veganart if you give it a go. Thank you! Preheat the oven to 200 °C: Line a baking sheet with parchment paper. Cut the two broccoli heads through the middle and cut into long strips using as much of the stem as you like. Place all the broccoli on the baking sheet, season with salt and pepper and olive oil and roast for 20 minutes. Place a large pot of water on the stove and bring it to a rolling boil and season generously with salt. Place the spaghetti into the pot and cook until al dente, about 10 minutes. Drain into a sieve and put back into the pot and season with olive oil and add the arugula to the spaghetti and mix to combine. For the tahini dressing, put all the ingredients into a blender and mix for about one minute or until completely smooth. For the harissa, saute the chopped onion and garlic for about 5 minutes until the onion has caramelized. Add the spices, chili and tomato paste and saute for another minute. Finally add the soya sauce and lemon juice and cook briefly. You can keep the sauce chunky or blend it to a smooth consistency. Transfer to another bowl or container. 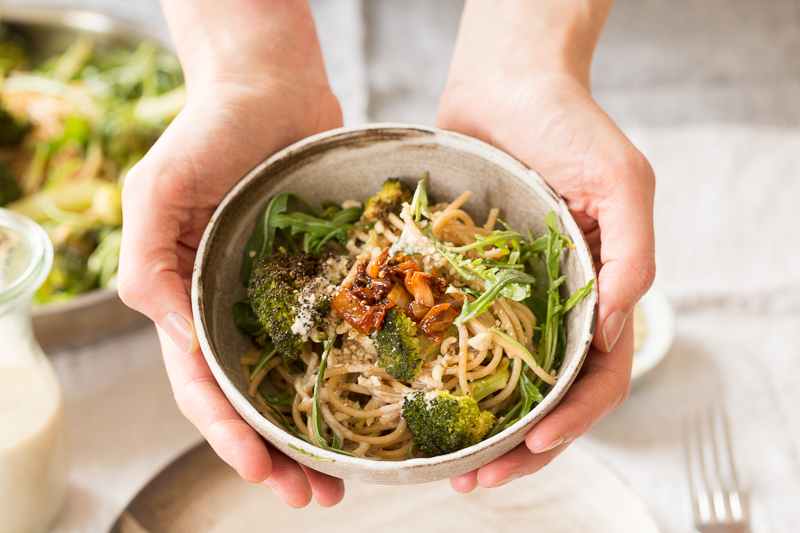 To make the hemp parmesan add all the ingredients to a blender or food processor and pulse for a few seconds until it has broken down a little. It should look like bread crumbs. 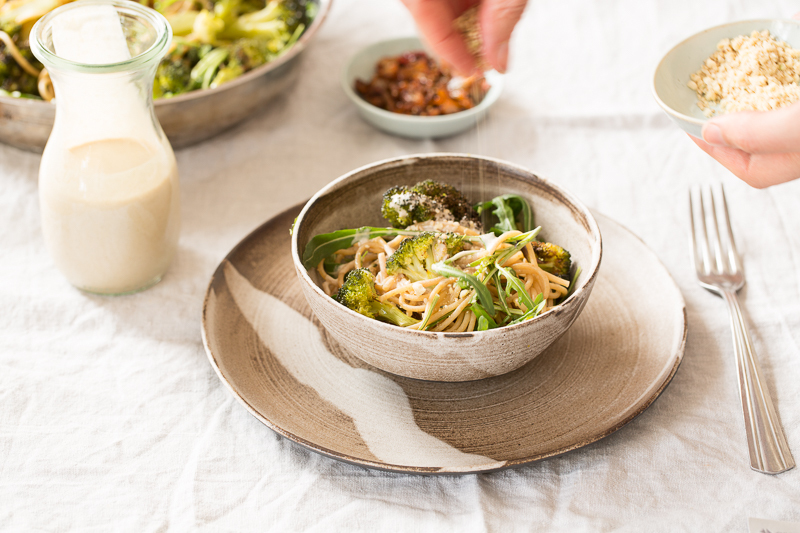 To serve, place the spaghetti in bowls and top with the roasted broccoli, tahini sauce, harissa and hemp parmesan. Enjoy!